RStudio makes data analysis software used by millions of researchers, analysts, and scientists. 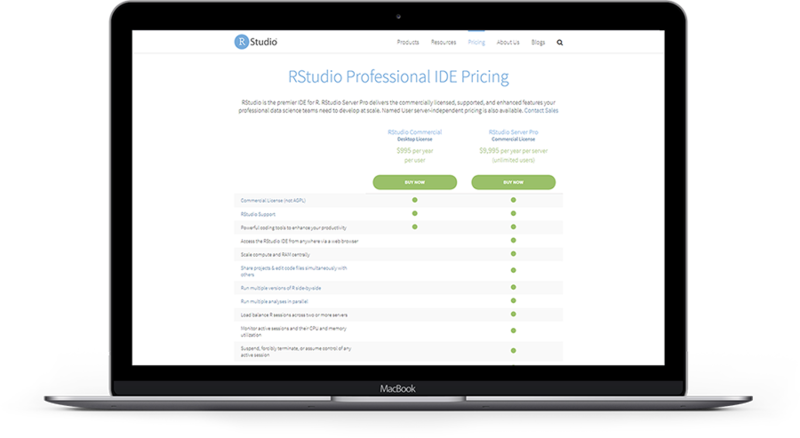 RStudio uses a freemium model. The vast majority of users enjoy the free open source product - evangelizing and creating an active community around RStudio. Customers with specific needs such as enterprise grade collaboration, security, and support pay for the flagship enterprise products. 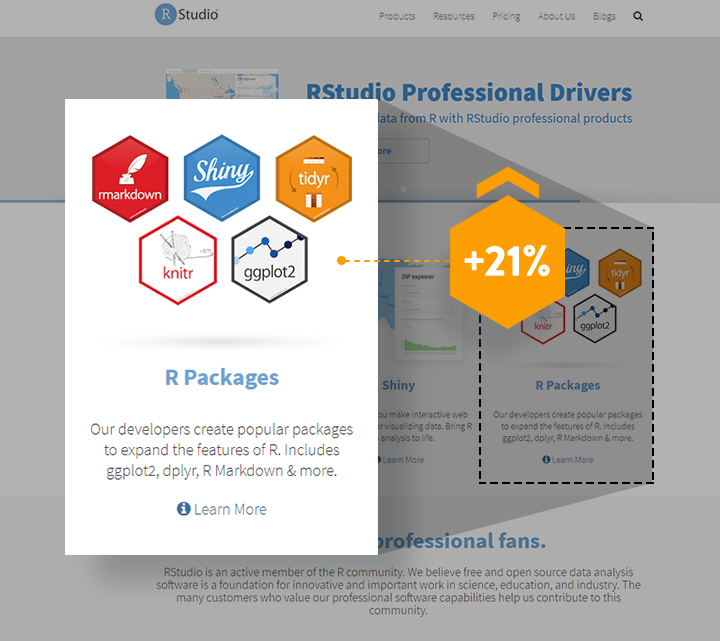 RStudio's biggest challenge is supporting their millions of open source customers, while creating awareness and demand for their paid products. RStudio presented Spiralyze with the mission of growing both the free and paid conversions. Downloading RStudio software is the most common reason for visiting the site. But, research showed that users often got lost on their path to download. Once they found the download page, they were often overwhelmed by the number of download options presented. Spiralyze made the path to download more prominent. We also created a default download option that served the vast majority of users. 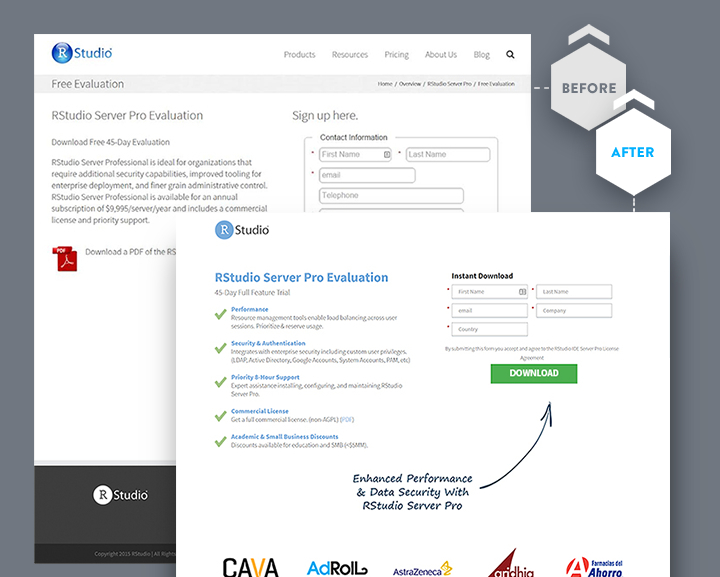 At the same time, we exposed free users to our paid products to increase awareness and seed future paid conversions. On lead pages, where prospects were offered free trials of premium products, prospects were often unclear on the benefits. They were also unclear as to when they would receive the offered free-trial. We simplfied and rewrote copy, added clearer CTAs, and bolstered credibility. Surveys showed many enterprise users were unaware of paid enterprise options. We increased awareness of the paid options. First, we built more bridges between the free and paid products - so that users headed down the free funnel were given paths and motivation to switch to the paid funnel. Second, we improved messaging on paid products - focusing more on a narrow set of features, such as advanced data security, that are critical to the enterprise decision maker. A side-effect of increasing the conversion rate was that the salesforce quickly became overwhelmed with the quantity of leads. To reduce the number of leads, we increase the prominence of self-serve options where a customer could complete their purchase online. We also added more pricing information, so leads pre-qualified themselves as being comfortable with the pricing structure, leading to an increase in lead quality. 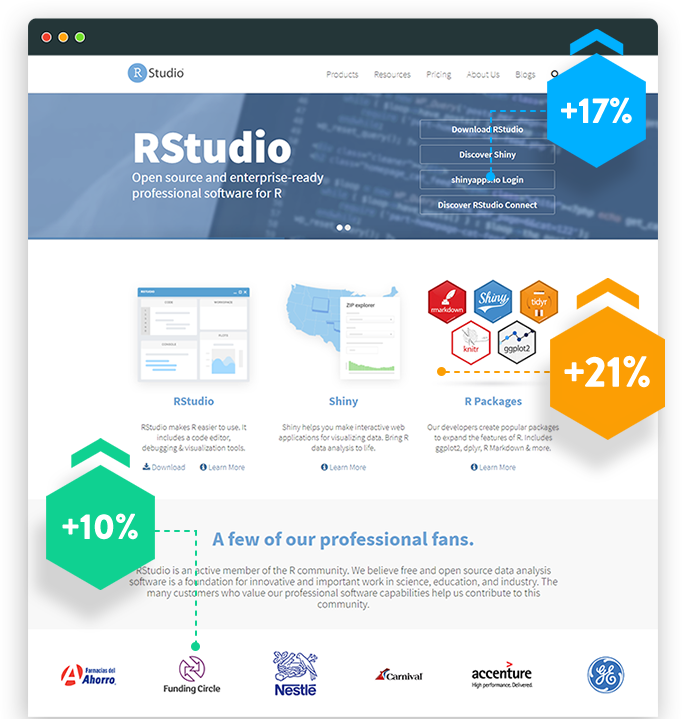 Over the course of 26 tests, RStudio enjoyed wins across their full product range and across the conversion funnel. Cumulatively, they saw triple digit increases in conversions for their paid products and double digit increases in conversions for their free products.